Economist Elliott Pollack looked into his crystal ball: 2017 will be the year of the tortoise. 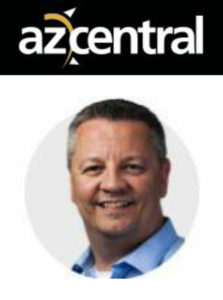 If it’s fall, it must be time for Scottsdale economist Elliott Pollack to look into his crystal ball for the upcoming year. On Tuesday, Pollack told the 700 who attended the Greater Phoenix Chamber of Commerce’s annual economic outlook breakfast that 2016 is the year of the snail and 2017 will be the year of the tortoise. Whatever you call it, here are five things to look for in the year ahead. The current economic expansion that began in June 2009 is among the longest on record, though growth has been underwhelming in that time. Pollack said shocks and other problems end expansions, not old age. Keep an eye on quarterly growth. Arizona’s economy has been sluggish compared to years past, but that’s in part because fewer people are moving into the state than in the past. Newcomers have always helped push up job creation numbers, but with fewer of them, job growth has slowed considerably. Look to see whether state-to-state migration picks up as a clue for job growth. The housing market in metro Phoenix continues to slowly improve rather than bound ahead, in part because a large segment of potential homebuyers aren’t buying houses. We’re looking at you, Millennials. One lingering product of the Great Recession has been the increased popularity of renting rather than home buying. Apartment construction has gone up, but home building permits have remained stubbornly low long after the downturn. Next year metro Phoenix could approach 20,000 building permits issued, which would be less than a third of what was issued in 2006. Watch construction employment to see if more homes are (finally) going up. Whether it’s cost concerns or something else, the average age of cars keeps going up. That has an impact on new car sales, indebtedness and other items. It may be a sign of improving consumer confidence if you find a new car in your neighbor’s driveway.